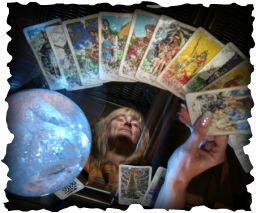 The tarot is used as a tool for divination. Notice I said they are a tool, as ultimately, no matter what guidance comes up in a reading for you, the choices you make in your lifetime are up to you and only you. The tarot takes us on a path of self-discovery by putting us in touch with our inner world. This allows us to see the realities of our lives. Tarot offers us a way to have dialogue with ourselves and aid in our own growth. Tarot helps us open our minds and hearts. Over my many years of study and work with the tarot, I have found them to be and invaluable tool. The tarot shows me your past and the situations which have led you to your present circumstances and then indicates what most likely will occur in the future. Remember the future is yours to mold, I believe in God and the Angels with all my heart and as such, my readings tend to be spiritual in nature. It is my belief that the information that I receive in a reading is directly from God and the Angels; I also feel truly blessed for this Gift that God has given me. It is my sincere desire to help people to reconnect with their spiritual side and see how truly wonderful life can be when you listen to your inner guidance. Example: gut feelings, hunches and those little voices. My readings are very positive, I do my best to encourage you on your life path by giving you the tools to help you manifest the life you want. Since we manifest our lives with our thoughts, positive thinking is a must. We can all have the happy lives that we deserve and desire. I would love to help you find the way. Some of the most common questions asked are about "Love Life" - how to find one, how to get rid of one (Don't laugh, they really do ask), "Money" (Never how to get rid of that), "Children, family or pets", "Outcome Questions" - what is the outcome for me if ...., what is the out come if I don't.....(You get the picture). Basically the sky is the limit. What we talk about in our sessions is between you and me. I will never share your information with anyone else. I always recommend that you have your questions ready at the time beginning of your reading, so that we can focus on what you are really needing guidance to. I can give you a lot of information in a short period of time using this method. Being that I am also a Usui Reiki Master, during the course of a reading, you will also receive a Reiki treatment. This is partly why people always tell me that they feel so much better and more relaxed after a reading. I also recommend that you give the information that you receive in a reading time to manifest, or time for things to change. If nothing changes you will get the same reading every time which gets frustrating for you.